Today we head off on our travels! We'll be returning to Italy, except this time we're going via Portugal. We're be there for a week or so; to explore and investigate and enjoy the country. From there we'll drive down to Italy, in time for the appeal. Fingers crossed that everything goes in our favour! I will of course get online when we reach our first destination and post fundraiser updates. 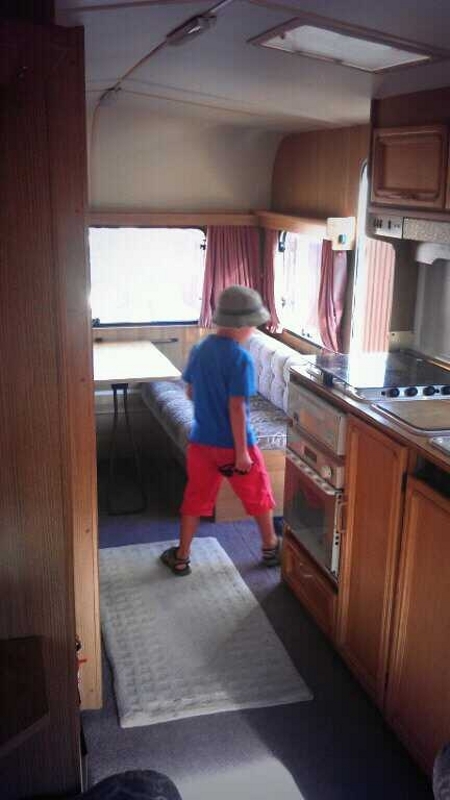 This is our new caravan, a bargain of a beast. She's sound and dry and has more than enough room for this small family. She cost us less than we budgeted for, which left us enough to afford a service in preparation for the long drive. She's in good working order! We've converted the far end to permanent beds, with Aran's bed as a bunk above ours. It's seriously comfy and homely, even though we haven't yet personalised the decor. When we get to Italy she'll be our new spare room (seeing as last years caravan purchase is now my office); she's more like a spare apartment than a room.